Services marketing and Service strategies. Developing & managing Intellectual assets. Dr. Jayanta Chatterjee is a renowned practitioner with rigorous academic involvement. He has ten years of Management teaching experience and 30 years of management experience in different countries. Starting with Siemens as a Sales Engineer in India (1972) he went on to pioneer the introduction of programmable control & advanced power electronics systems at Allen-Bradley India (A Rockwell Joint Venture with Crompton Greaves), where he rose to the position of President & CEO in 1990. During his tenure the India operation saw spectacular growth and became a dominant player in the Enterprise Automation market of the region. Jayanta was nominated for Rockwell global awards during 1993, 94 & 95. He was chosen as the 'Manager of the Year' by Delhi Management Association in 1994. He was in the lead group of Rockwell Country managers in the Asia Pacific Council. He helped to setup new operations and assisted merger & acquisition projects in Korea, Japan, Singapore and other countries of the region. Simultaneously he continued to pursue his research interests in strategic management of technology and marketing. In 1996, Chatterjee was promoted to Rockwell International (Costa Mesa, California) as the Executive Director for technology and business development. Later he cofounded and was the Chief Knowledge officer of Plex in California, a venture funded CRM system developer during 2000-2001. He did his graduation in Electrical Engineering from Jadavpur University (best graduate of the year) and his M. Tech. as well as Ph. D. in Management Systems from IIT Delhi. Jayanta is a Senior Member of IEEE, USA and an Alumnus of Rockwell's Global Leadership Programme and the Aspen Institute Leadership Programme. 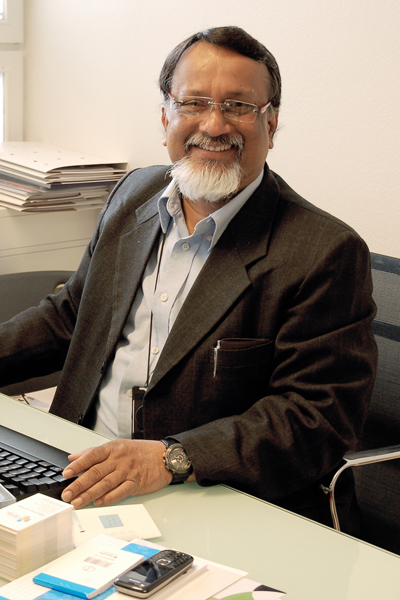 He is a founder EC member of the Engineering Management Society of IEEE in India. He has been a visiting faculty at IIT Delhi and Kanpur since 1994 teaching Strategy & Business Policy, Service Management , Creative Problem Solving, Cyber Marketing and Knowledge Management. Jayanta is a popular speaker at management conferences . Since 2001, Dr. Chatterjee is in full time academics and a Professor at the Industrial and Management Engineering Department of IIT Kanpur .He is a consultant and coach for several high technology companies and their key executives and continues to be a venture catalyst. Rockwell Corporate Leadership Programmes in USA and at Aspen Institute Programme of USA. VI ePlex India, New Delhi & Bombay, India. Customer centric e-Business and eCRM consulting. eTransaction management and Alternate payment systems. VC and Pvt. Equity raising, Angel funding. Fortune 500 global leader in electronics, control and communication, avionics, semiconductors. Established new business units for Semiconductor Systems and Automotive IBU. Set-up Regional Global sourcing operation. Regional leader for the Growth Council Projects (WLL/WLAN/MMI). Completed major acquisitions and Joint Ventures. Coordinated India Development Center operations. President - Allen-Bradley India Ltd. Led a sixfold growth of the business from 1991 to 1996. Established new product lines through innovative marketing strategies and strategic JVs. Coordinator, Asia Business Operating System and BPR. Member of Crompton Greaves (JV partner) CEO Council. Led ISO 9000 Certification and TQCS implementation. Tangible and Intangible Justifications for Manufacturing Automation Investment in India - and approach for quantitative modelling, Proceedings of 4th International Conference on CAD, CAM, Robotics and Factories of the Future 1989. (Conference Publication). Using Fuzzy Logic and MCDM for Technology Choice, Paper presented at the Operational Research Society of India during December 1990 (2nd best paper award). (Conference Publication). Corporate Management and comparative work culture, Three articles in Economic Times, Delhi, April - June 1992. (Popular Press Publication). Strategic approach to Product Design, Page 63 to 73 in the book Technical Entrepreneurs published by Global Businers Press, 1992. Strategic approach to High Technology Entrepreneurship - Proceedings of IEEE International Engineering Management Conference on "Managing a Global Environment" at New Jersey, USA, 1992 (Published in IEEE Proceedings Oct., 1992). Synectics for strategy innovation, Workshop leader, IIT Delhi, December 1996. (Conference Presentation). Corporate Responsibility, Chapter 9 of the Book Corporate Governance and Businers Elthies, AIMA/Excel Books, 1997. The e-Merging Paradigms of the CRM Multiplex, Articles in the MM 1st Anniversary Special, December, 1999. (Manufacturing Management Journal). Managing the K-Factor, Article on Knowledge Management in the Business World, 7February, 2000. (Popular Press Publication). Byting Relationships, article on Customer Relationship Management in the A&M, 15 February, 2000. (Popular Press Publication). Leverage IT with E, article on Customer Relationship Management in the Computers Today, 16-29 February, 2000. (Popular Press Publication). Strategies for the Enterprise, Three white-papers on eCRM and The Net Business at the Vi eplex Website. (Publication on the Web). The Changing Face, article on Call Centre in the Voice & Data, June 2000. (Popular Press). Comerstones of Enterprise Flexibility, A Vikas Publication, 2000. (Chapter in a Book). Paradigms for the 21st Century Organization and the Knowledge Chain Management, ICM National Workshop on Knowledge Management, New Delhi, August, 2000 (Conference Publication). Managing Customer Relationship in the e-Business Economy, article on CRM in the Journal of Scientific & Industrial Research, August - September, 2000 (Journal). Impact of Internet on Marketing and the Integrated Approach, Course Material for PSU Sr. Management Workshop at ASCI Hyderabad, September, 2000 (Conference Presentation). Integrating eCRM and SCM applications for Business Acceleration, CRM Foundation National Seminar, Bombay, October, 2000. (Publication on the Web). Let Us Make Knowledge Management Fun and Common Place, Proceedings of ICM Seminar on Seminar on Knowledge Management, Bombay, October, 2000 (Conference Publication). BALANCING EXTERNAL AND INTERNAL FLEXIBILITIES - Emerging Strategy Paradigms for Indian Organizations, article on TBOs in the Journal of Global Institute of Flexible Systems management (GLOGIFT), December, 2000 (Journal Publication). Enterprise Information Portal - A New Competitive Tool for the Knowledge Economy, A paper for Transactions on Flexible Systems management, 1st International Conference, December, 2000 (Conference Publication). Exploring the Frameworks of Strategic Flexibility, A Vikas Publication, 2000. (Chapter in a Book). Paradox and Flexibility: Strategy of Perennial Renaissance, A Vikas Publication (To be released). Can Call Centres Boost B-to-B E-Biz?, article on Computers Today Magazine, 16-28 February, 2001. (Popular Press). eLearning for eCRM, article on Itspace.com, February, 2001. (Publication on the Web). Technologies for Knowledge Management - Seminar proceedings organised by HECL, Sept 2001. From IM to KM - the softside is harder - Proceedings of KM State of the Art in India organized by TCS & IIITMK, Trivandrum, Nov 2001. Implementation issues in KM - NITIE Journal, India, March 2002. Knowledge based strategies & research directions in India - Kware conference proceedings, IEEE, July 2002. Paradox of Knowledge Management - select dimensions of implementation cases, 4th Asia Pacific KM Conference, Hongkong, October 2002. Incubation network as a National Innovation System - proceedings of the Indian Sociology Congress, Dec 2002.
Business impact of technology trends, the case of A.C Drives in India - PEDS2002, IEEE, Jan 2003. A Digital Ecosystem Model for Competitive Agriculture, Page 232 to 241 in Knowledge Economy, The Indian Challenge, Sage Publications, Delhi 2009, ISBN 978-81-7829-909-9. Services Innovation – An Ecosystem Approach to Rural Digital Services, IEEE CASE 2009, 22nd to 25th August, 2009, Bangalore, DOI Code:10.1109/COASE.2009.5234097/IEEE, Pattanaik D. and Chatterjee J.
Socio-Technical Innovation and the Role of Conversation in a Digital Ecosystem, IEEE DEST 2009, (Selected as best paper in the Ecosystem Social Science Category), 31st May to 3rd June, 2009, Proceedings CD, Part 3-June3, Pattanaik, D., and Chatterjee J. From Idea to Business – Finnish Model for Creating a University-based Innovation, 9th International Entrepreneurship Forum, University of Essex, Paper No.48, CVD Publication, 16th to 18th September, 2009, Conrad Istanbul, Hammalinen, M., Itkonen M., Chatterjee J.
Socio-Technical Innovation and the Role of Conversation in a Digital Ecosystem, IEEE DEST 2009, (Selected as best paper in the Ecosystem Social Science Category), 31st May to 3rd June, 2009, Proceedings CD, Part 3-June3, Pattanaik D., and Chatterjee J.
IIT Kanpur, visiting faculty: 'Business Policy and Corporate Strategy'. IIT Delhi, visiting faculty: 'Creative Problem Solving, Strategic Technology Management' . ASCI, Hyderabad, Visiting faculty: e-Commerce, Cyber Marketing, B2B Marketing (Short Term Courses). IIT Kanpur, Visiting Faculty, eMarketing , Knowledge Management . IIT Kanpur, QIP Programme, Intelligent Business Decisions. IIM, Calcutta, MDP on E-commerce Strategies, December, 2000. (Co-instructor with Prof. A Chakraborty from Finland Technical University & NJIT). IIT Kanpur, full time faculty, Knowledge Management, Organising for Services, Services Marketing, Service operations, Managing High Technology, Managing Innovation. Research on advanced technology in rural markets (Media lab Asia). Research on Wireless local loop deployment as an Infrastructure acceleration strategy - Joint Research programme of Rockwell Science Centre and Harbour Research Foundation (1996 to 1997). Research on Corporate Intrapreneurship and Internal Venture Fund (1998). Digital Mandi - electronic trading of agrocommodities, Media Lab Asia. Marketing strategy and Organisation development - Softedge International/ Hummingbird Inc.
Concurrent remote design center projects - Rockwell Semiconductor Systems, Meritor Automative, Conexant Inc.
Marketing strategy & Organisation development - Softdel Systems, Dalal group. Knowledge management architecture for customer help desk - Venture Infotek Global Ltd. Web based collaborative model for Supply Chain Excellence. Business Models of Call Centres. Developing a management game for studying cross impact of etailing strategies. Business models for mobile data service network providers. Marketing of mobile telephony in semi Urban Indian markets. ICT impact on Retail business strategies. Empirical measures of intangible assets using tangible consequences.